The Ricoh GR and GR II is a beautifully engineered digital photo camera with excellent optical quality in a small package. It is the smallest and lightest camera with APS-C sized sensor and fixed prime lens! I bought my GR second hand in 2013. Next to the ten other cameras the Ricoh became my most used camera until today. In total I made 71.005 photographs with the GR. That is 52% of all my 135.117 photos since 2013. Although it is highly praised and recommended among many popular street photographers, technical problems can develop over time. With a high price tag around $500 the GR & GR II is not a cheap camera. With proper precautions and care those common problems can be avoided and fixed if necessary. Since the Ricoh GR and GR II are same build models all mentioned problems and fixes are applicable to both. After power on the shutter of the camera is still closed and the display is black. The shutter will “unlock” , either after making one “dark frame” exposure or by pressing & holding the shutter button while turning the camera on. How does it affect the photographic process? The start up/ready to shoot time is increased from 0,8 to 4 seconds. The ability to make captures spontaneously is significantly decreased. Press & hold the shutter button and turn the camera on. Contact and send the camera to an authorized Ricoh camera repair service in your region. Where is more information about this issue? My GR died after 11k shots. Is this the average lifespan of a GR? GR/GR II life expectancy …? GR closed lens on startup – dust? The ability to trigger the shutter and make captures spontaneously is inhibited. Use gloves :) just kidding, I am not sure if this can be avoided at all. Undocumented for the GR, but a possible cleaning method would be to turn the camera upside down and inject a small amount of electrical contact cleaner under the button. The GR is NOT weather sealed. Small dust and other particles will get inside and on the sensor over time. Always store the Ricoh GR in a dedicated, lockable camera bag! Try not to shoot directly against strong winds or towards an outdoor driving direction. Buy and mount the GH-3 Hood & Adapter + a 49mm clear filter to seal off the lens. Leave it as it is. Consider shooting with wider apertures and remove/mask out dust in post-production. Rubber Grip starts to peels off. 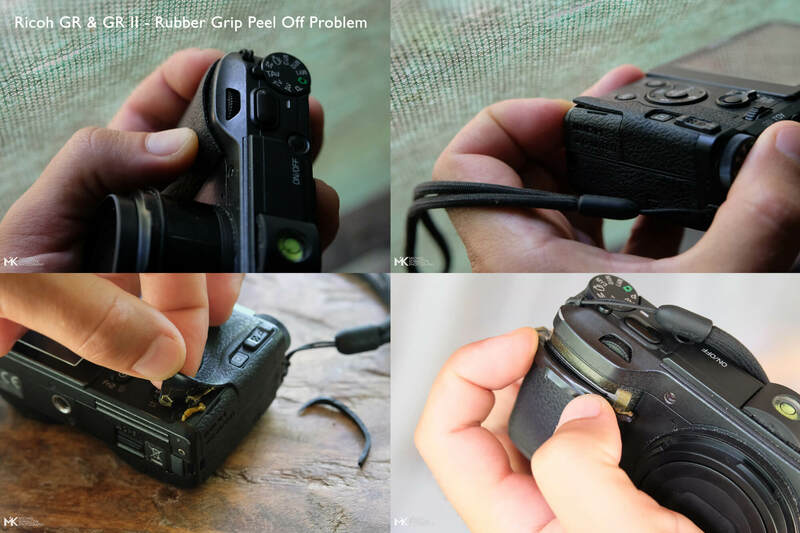 With daily use, the glue below the rubber becomes less sticky. The front rubber grip starts to stretch, moves and finally peel off at the top. The same happens with the back rubber. Touching the grip does not feel stiff and secure anymore. The overhanging rubber becomes annoying. The photographer’s fingers are touching and pressing against the rubber grip. This heats up the rubber below. Over time the glue becomes less sticky and allows the rubber to stretch outside the rims. I think the problem can only be avoided by not holding the camera for extended periods of time. Cut away the overstretched and excessive rubber parts. The remaining rubber should fit nicely inside the body rim again. Remove the old, yellow looking glue. Use superglue to attach to remaining rubber the body. Be very careful not to spill the glue over the body or controls. It is very reactive and fast drying! Where is more information about the issue? Please contribute if you experience other problems / solutions and post your comments below. Thank You Harold for the feedback, I added your important suggestion regarding the GH3 Hood & Adapter! I have a ricoh GRiii which is taking very odd pictures. Blurry and to bright even when held still. When zoom in can see horizontal lines. Sorry to hear, sounds like a hardware defect to me. I haven’t got the lens hood and I’m reluctant to do so. There have been plenty of reports of others using the hood from day one and still getting dust on the sensor. 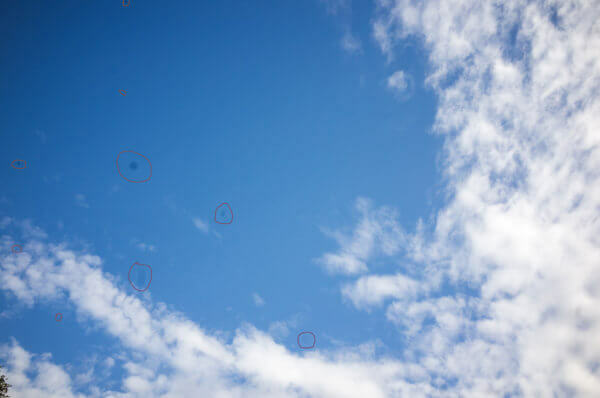 Apparently the lens is very well sealed from the sensor. Dust most likely gets in from other places. The rocker switch being one. Hello Rob, thanks for your thoughts on this. Could you share a link to the report from others? It did not occur to me that the rocker could be a point of dust entry. For sure finger-dirt/skin is accumulating there over time. With my first GR the rocker became less responsive after 3 years or so. I am traveling through South America with my GR II & always on GH-3 Lens Adapter for 7+ months now. Besides sealing the lens against wind and dust the adapter + 49mm clear filter helps a lot to keep the lens dry. I shoot during light rain occasionally and can confirm that the hood gives me the confidence to do so. Additionally, it allows me to mount the wide-angle lens or my polarizing filter. Hi Anthony, I am not sure what to do. Sounds like a hardware problem. Consider sending it to a repair shop or look for spare parts on Ebay? Such a shame that the GR is not weather sealed. This is the must important issue for street photo in the winter. I agree with you Fred. I damaged my first GR while shooting in rain some years ago. The shutter became sticky and I had to shoot one dark frame before it would open again after power-on. Soon after purchasing the GR II I invested in the GH-3 lens adapter and a clear filter. It was a good, protective decision. Since nine months of continuous travel and daily shooting in various conditions, I never experienced any moisture/dust issues.